This year, for several months already, Natives of French Guiana have organized protests and strikes that ultimately forced the authorities and the media to notice them and report about them. The Indigenous Movement in French Guiana started long before, but it is only when the protests and strikes began to disturb the quiet life of settlers and authorities that they were forced to talk about it outside Guiana. Of course, the response of the French Government is totally inadequate. However, the existence of Indigenous Peoples “in France” has become visible. 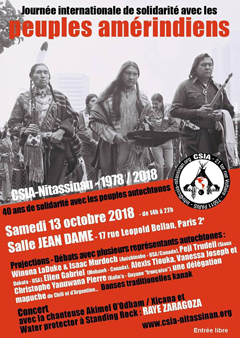 On October 14th, 2017, Christophe Pierre aka Yanuwana Tapoka, was among the speakers invited by the CSIA-nitassinan for their 37th Annual Day of Solidarity. You will find below my translation of Yanuwana’s speech. 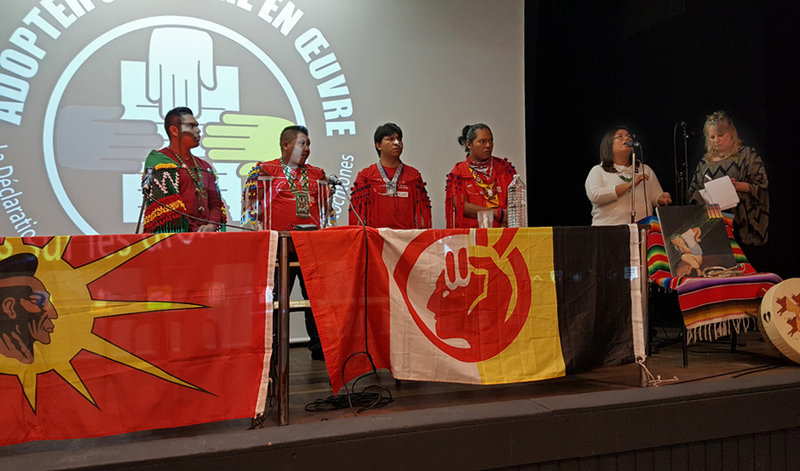 Before he spoke, a delegation from Natives of French Guiana came on stage to remind French people that there are “Indians in France”. The title was chosen by me, from his words, the responsibility for the choice is entirely mine. “Greetings to you all. My name is Christophe Pierre in the language of the colonialists, Yanuwana Tapoka in my mother tongue. First, I think it is necessary to describe, to give a short overview, of the situation and history of French Guiana, which is currently, in legal terms, a French ‘département’ [county], a French ‘region’ like any other. What is French Guiana? French Guiana is in South America, it is a French Amazonian territory. It is 50% of the biological diversity of Europe, 80% of the biological diversity of France. It is about 300,000 inhabitants, including a handful of Native Americans who survived colonization; a handful: if we really have to give figures, it’s between ten to fifteen thousand, according to the latest information. As compared to those ten to fifteen thousand, it is nowadays estimated that, when the colonialists arrived, there were 25 to 30 Peoples, there are only six left today. Those six Peoples are the Kali’na, the Palikuyene and the Lokono, who live along the coast, and the Teko, the Wayãpi and the Wayana who live inland. Problems are different, power relationships are different depending on the geographical situation, but the struggle is practically the same, since the 1980’s. The first gathering of Native Americans of Guiana took place in Awala, in 1984 – on December 8th and 9th, 1984. 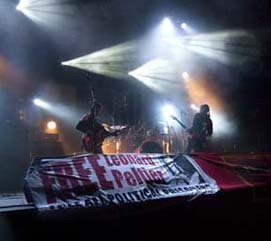 It was the first time that youths – youths at the time, now they are Elders – Native youths, spoke out against the French institution and took a political stand. 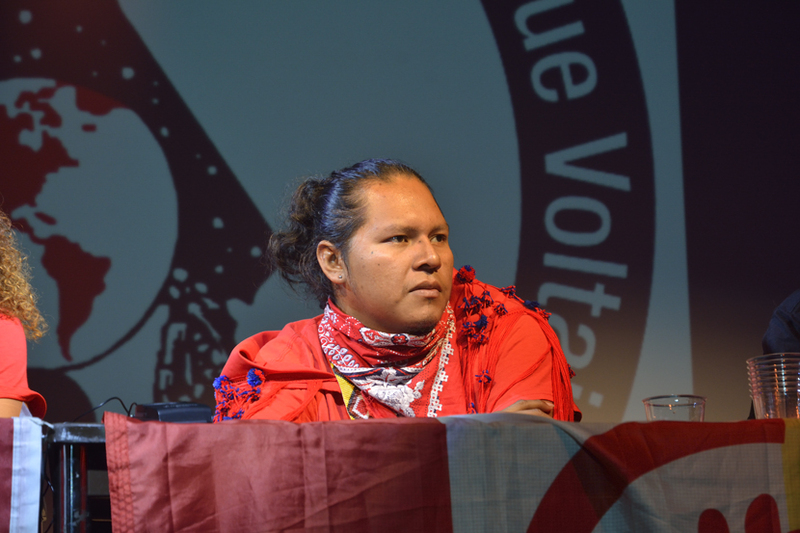 This meant that a new form of struggle began for Native Americans of Guiana, a political struggle symbolized by Félix Tiouka’s speeches – I think that CSIA supported that struggle – together with Alexis Tiouka and others. They were young people who had been in the ‘Indian’ boarding schools. The Indian boarding schools meant abducting children from the families, taking children away from their parents, and put them in catholic boarding schools, where they were forced to learn the Catholic, Christian religion, from 5-years-old on, sometimes even from 3, where speaking our languages was forbidden and where, thus, a massive destruction of our traditional societies occurred. For 80 years, France ran them through the Church, and still does now… [most of those boarding schools are now closed, but at least one still exists, due to the lack of schools in some Indigenous territories]. We have a special status, in French Guiana, that makes it a territory that still has to be evangelized, as priests still get their wages from the French State. 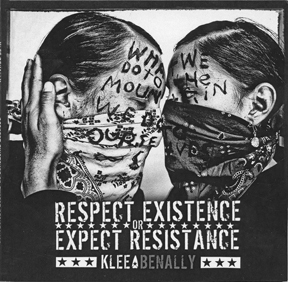 We had to face that situation, to confront a Guianese political class which did not want to hear about Native Americans, to confront France, which had almost exterminated Native Americans, physically, culturally, and in their identity. 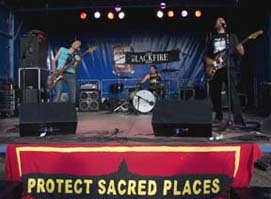 In the 1980’s, there was a youth movement mainly following leaders as Alexis Tiouka, Félix Tiouka, Thomas Appolinaire, who have been involved, in the following years, in the creation of French municipalities with Native American governance, as well as what has been called later ‘collective use rights areas’. Those collective use rights areas are the only possibility we had to try to get back some of our ancestors’ lands. Thus, that’s where we were then, some statements were made, then the Association of Native Americans of French Guiana is created, which will include members of each Nation, of the six Nations, and will later become the Federation of Native American Organizations of Guiana (FOAG), which will lead struggles to spread information internationally. The FOAG appealed several times to the United Nations and came several times to France, to meet, for instance, President Chirac, and to take part in the campaign for recognition of those crimes that were the ‘human zoos’, in the Jardin d’Acclimatation, here in Paris. In 1994, a ceremony took place, here, at the Jardin d’Acclimatation, where, in 1858 – I think, maybe a few years later – Kali’na who had been taken from villages were exhibited in the human zoos, in the Jardin d’Acclimatation, in Paris. Most of them never returned, they died from the cold or something else, and the bodies are still held by France. The bodies had been dissected, later, experiments had been done on them. Thus, we are still trying to struggle on that issue. There has been a ceremony for the rest of their souls, once. This is our history with France, until, approximately, the 2000’s. Then there has been sort of a dead silence, nothing was heard any more about Native Americans. The leaders of the time were getting exhausted, some of them have, I think, given up, dropped the issue, as, let’s say, the destruction of Native American identity had gone so far, that it was difficult to mobilize the people, even villagers, on issues that affected them directly. As a matter of fact, assimilation had gone so far, that we almost disappeared as a people. At the same time, illegal gold mining had begun. From the years 2000’s, the first illegal gold seekers settled in Wayana and Teko territories. With all the usual consequences, mercury poisoning, poisoning of the fish, birth defects for children… On several occasions, the Wayana tried to warn the French State, demanding for a direct solution to suppress illegal gold mining. Today, we have come to realize that illegal gold mining means that there are about 30,000 illegal gold seekers a year, Brazilian or from Guyana, present in the National Park called Amazonian Park of Guyana, and they keep polluting rivers and streams. There are 120 kilometers of waterways in French Guiana, and now, if we really look at it, there is only ONE river which is not polluted by gold mining. The Guyana Plateau, the north of Amazon, is the second largest freshwater reserve in the world, after all, and the mountain range from the south border between Guiana and Brazil to Venezuela, where the Orinoco begins, is one of the sources of the Amazon River, the largest river in the world. This is the situation with which the Wayana are confronted, and today they get very little support. On the national level, the French State puts up missions – ‘Anaconda’ was the first – and operations, but they are ineffective: some twenty military police raid an illegal site every now and then, but I think that 275 have been reported and located, this year, and there are still others which are not yet located. 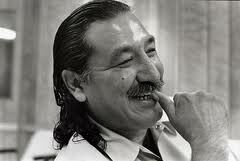 Thus, this dead silence prevails, until the 2010’s, and then, there is a revival of Native American identity. This is what we always try to explain, again and again. Still, I think that we belong to the generation that has gone all the way through it. In the 1980’s, they were the first who had had some education and knew French, and understood how absurd what was proposed to us was. In the 2010’s, we were the first generation that completed college education, we had a lifestyle model very much the same as that of any western citizen. But having gone straight, all the way, we realized, first individually, as each member of the Indigenous movement, that it did not fit us. We had received a traditional education and teaching, as we did not go to the boarding schools, but we did not acquire the deepest aspects of Native American identity. And when we came to realize that, it was very violent for us. As a result, we started with the opposite process to re-appropriate our Native identity, the identity of our respective peoples. So, starting from there, realizing what is proposed to us, what is happening in the whole world, we decided to take matters in our own hands and to start doing things, but in a different way from what our Elders had done. Our elders were somehow scared, they were alone, they felt very isolated. The dialogue, the relations they had with France were different from ours. Today, we want a change, and we are ready to do anything for it. So, starting from the fact that ‘we are ready to do anything’, we began to undertake actions, and we soon realized that the French State had done its work well, that the French EMPIRE had done its work well. France is the most gifted colonial country in the world. The United States, the South American countries, are all small players, compared to France. They created ways to put peoples to sleep. Nowadays, for instance, France signed the United Nations Declaration on recognition of Indigenous Peoples. But it is only declarative. Today, it is still written in the French Constitution that Guiana is an unoccupied territory, without owner, and that when the French arrived, there were no human beings on Guiana lands. Today, if you realize what French law means, we are peoples supposed to mainly live off the forest. This is our status. 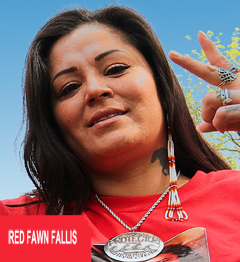 And today, we realize too that, to say it lightly, the Native American struggle has become fashionable again. It is true that it feels good. And, (to come back on what Edith said earlier), that is why we said that, why we are our ancestors’ wildest dream, it is because 525 years after the end of our world, that world has disappeared. The one we had for thousands of years, that territory on which we roamed around, to which we belonged and which belonged to us. It is this relationship we had with those lands which disappeared then. Everything disappeared. At the moment when our worlds met, it was the end for us. Today, there is not much hope left over. In a few years – we reckon 20 years – in 20 years, thus, we shall be able to see if we succeeded or not. We don’t have hundreds of years ahead of us. Twenty years ago, we could say ‘it’s time to take action’, now, this time is gone. How shall I put it? We must be twice as much active, but the world you proposed, the world with which you came, is devouring itself. How did you do that? I don’t know. 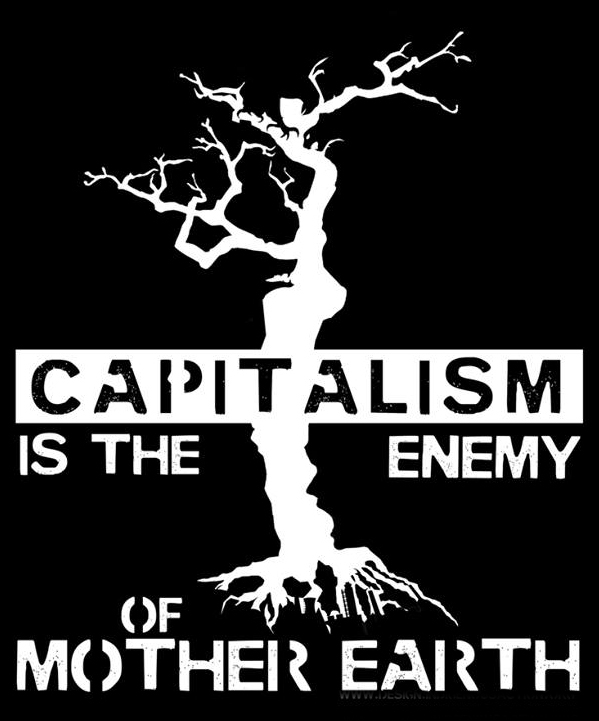 But to manage to convince the world that water, forests, land and air are only secondary elements, which can be destroyed in the name of development, is something I can’t find words to describe… You are Masters!